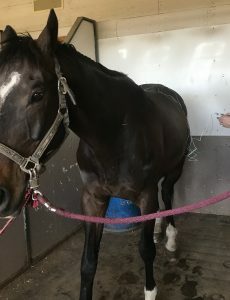 Abstract: Rascal is a 9 year old thoroughbred primarily used for dressage that has suffered from chronic back pain for several years. Rascal has had varying treatments for back pain including hock and fetlock injections, chiropractic treatment, custom saddle fitting and amino acid supplements to improve topline muscling. Acupuncture treatments were done once weekly for three weeks. Rascal’s back pain significantly improved over the three weeks based on the physical and myofascial exam and stayed improved for 3 weeks after the final treatment. History and Presentation: Rascal is a 9 year old off the track Thoroughbred used primarily for 1st and 2nd level dressage. The owner’s primary complaint is back pain through the thoracolumbar region. The owner also feels as though the horse is not pushing from his hindquarters. The owner reports that back pain has been an off and off problem for several years. Rascal has had regular dental floats and vaccines for the past 5 years. Rascal has a custom fitted saddle, meaning it is fitted specifically to his body shape and size. The saddle is fitted about once every one to two years, mostly recently being fitted last summer. He receives Legend (HA) injections intravenously once monthly and chiropractic treatment once monthly for the last year. Chiropractic evaluation has consistently shown a reduced range of motion and mild-moderate pain in the thoraco-lumbar region. Rascal has had several lameness problems over the last few years. He has had fetlock effusion on and off in the hind limbs and in 2015 Rascal had his hind fetlocks injected. In 2016 Rascal was grade 2/5 lame on the right hind, had positive proximal hind limbs flexions and had hock injections at that point. In summer 2017 flexions of the proximal and distal hind limbs were positive and Rascal had his hind fetlocks and hocks injected. In spring 2018 Rascal was graded a lameness of 2/5 on the right hind. Rascal once again had his hind fetlocks and hocks injected. Rascal has been diagnosed with mild-moderate hock OA bilateral and hind limb fetlock effusion. Rascal has a good attitude and is willing and eager to work. Rascal has also always had difficulty maintaining a muscular and full topline and was on Equitop myoplast supplement the last few years. Recently he was taken off of myoplast and switched to GroNwin feed supplement. Physical Exam and Clinical Assessment: May 8/18- TPR WNL. Balance WNL. Cranial nerves WNL. Myofascial slide decreased over the thoracolumbar region, worse on left side. Vertebral flicks moderate positive right and left in T14-T18 region. Mild positive response spinal rotation right and left in T14-T18 region. Moderate positive painful response lateral flexion right and left in T14-L3 region. Sacral squeeze was moderate positive on the left side. Hind limb circling to the left clockwise appeared more difficult than the right. Grade 2/5 lame on right hand. Flexions negative right and left front, mild positive proximal right and left hind, negative distal right and left front. Normal back up, small circling left and right, normal cranial nerve exam. Circumduction of pelvic limbs present. May 15/18- TPR WNL. Balance WNL. Myofascial exam slide improved over the thoracolumbar region. Mild pain at BL 23 on right side, significant improvement in back pain overall. Spinal rotation slight positive response at BL 23, left WNL- significant improvement compared to last week. Lateral flexion of spine right and left mild positive response T18- L3 region, but significantly improved compared to previous week. Sacral squeeze mild positive on left side. Hind limb circling to the left clockwise improved, but still more difficult than right. Normal back up, small circling left and right, normal cranial nerve exam. May 23/18- TPR WNL. Balance WNL. Myofascial slide similar to previous week. Myofascial exam mild response T16-L2 region on left along bladder line, BL 23 most painful on right side. Vertebral flick mild positive T18-L2 on right side, T18-L3 on left side. Spinal rotation WNL right and left. Spinal lateral flexion mild positive T18-L2 right and T16- L3 left. Sacral squeeze WNL. Hind limb circling WNL both right and left. Grade 1/5 RH. Normal back up, small circling left and right, normal cranial nerve exam. The definitive diagnosis being treated in this case is muscular thoracolumbar pain and myofascial pain in the thoraco-lumbar region. This is based on the physical and myofascial exam as well as the flexion tests. Neuromodulation rationale for the acupuncture approach and sequence of treatment- goal is to normalize nerve function, promote homeostasis and relieve pain. The insertion of needles along the bladder line were to stimulate mechanoreceptors in the epaxial muscles to cause a variety of physiological effects including vasodilation, anti-inflammatory. Another goal was to influence the nervous system at many levels including the thoracic and lumbar spinal nerves. The other goal was to do myofascial treatment to indirectly influence the nervous system through muscles and fascia via fibroblasts, collagen fibers and muscle spindle cells. Once weekly was chosen based on both owner/horse availability, my schedule, and looking at other clinical trials to see their frequency of treatment. Acupuncture treatments were done 1 week apart for 3 weeks. The first week only dry needling treatment was done. This was to see how Rascal responded to the needles and determine his comfort levels with the dry needle stimulation. The second and third treatments included dry needling and electroacupuncture. Needling points in treatment 1 included Bai Hui, LI 16, GB 21, BL 21, BL 23, BL 25, BL 27, BL 54, and BL 40. All of these points were applied bilaterally (except Bai Hui- not a bilateral point). Bai Hui, LI 16 and GB 21 were selected as good homeostasis points and also good points to see how Rascal would respond to needling. The bladder line points were selected based on the physical and myofascial exam (myofascial trigger points) for response/pain in the thoracolumbar region. Needling points in treatment 2 included all of the above as well as ST 36, BL 54, GB 29, GB 30. These points were added as anti-inflammatory points and to stimulate para- sympathomimetic function (ST 36). BL 54, GB 29 and GB 30 were added for possible hip pain based on the results of the small hind limb circling and to stimulate the sciatic nerve for hind limb function. Needling points in treatment 3 included all of the needling points for treatment 1 as well as BL 60 was added for back and thoracolumbar pain as a distal point. 25g 30mm Seirin needles were used for all treatments. The owner reports positive results from the acupuncture treatments. The owner reports more willingness to go forward, improved attitude when grooming and improvement in power from the hind end. 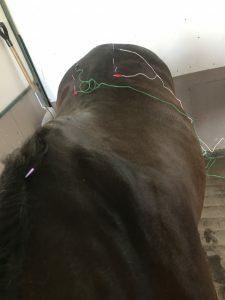 Overall by the end of the third treatment Rascal still had some positive myofascial trigger points but his overall pain on the myofascial exam had significantly improved. Rascal was purposely not treated with any other modalities during the few weeks of treatment in order to see how the outcome related to the acupuncture treatment only. There were no adverse event during the course of treatment. 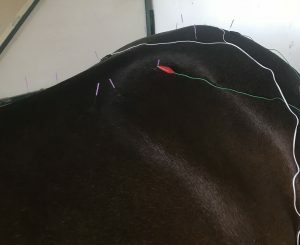 Rascal will likely continue to get semi regularly acupuncture treatments. I have discussed with the owner further workup of the right hind lameness. The owner is uncertain if she wants to further diagnose the right hind lameness at this time. Circumduction of the pelvic limbs may be due to a mild undiagnosed neurological disease, possibly wobblers. His other neurological tests are normal at this time. Circumduction of the pelvic limb may also be due to Rascal’s reluctance to fully flex and extend the limbs due to back pain or pelvic limb pain. This is an area that could be evaluated further. Poor performance as a result of chronic back pain is a problem I have struggled to treat. There are many factors that can contribute to chronic back pain, however I do sometimes have difficulty pin pointing one specific cause but I felt as though I was missing a way to treat long term myofascial and muscle pain. Back pain can be primary or secondary and has a lot of potential contributors including hock/stifle pain, general hind limb pain, saddle fit, conformation, rider ability etc. I have always tried to find the primary problem and treat that first. I have treated back pain with hind limb injections, shockwave, chiropractic treatment, saddle fit and mesotherapy with varying results and varying levels of long term success. Some indicators of poor saddle fit can be back pain, hair rubbing under the saddle, hair turning white under the saddle, uneven wear or sweat marks on the back. In this case I believe we can rule out poor saddle fit as contributing to the back pain considering the professional saddle fitting on a regular basis and absence of other poor saddle fitting signs. Phototherapy has not been implemented as a treatment yet but could have been used in this case to improve back pain. Phototherapy acts on cellular mitochondria to increase ATP production resulting in vasodilation, cellular proliferation of lymphocytes, endothelial cells, keratinocytes and fibroblasts and improved function of anti-inflammatory cytokines. This results in reduction of pain and inflammation and improved healing and added another level of healing to Rascal’s treatments. Chronic back pain horses may appear mildly lame and often are diagnosed with hind limb joint problems but lack radiographic lesions and do not block out3. In these cases there may be a diffuse myofascial syndrome present that can significantly contribute to back pain3. With this course I have learned how to diagnose and treat it with acupuncture and clinical trials show acupuncture as an excellent treatment to combat chronic musculoskeletal back pain1,2,3. I have also learned about many clinical trials that show positive results of treating equine back pain with acupuncture1,2. Future clinical and medical research requires more clinical trials in general on acupuncture (electrostimulation and dry needling) for thoracolumbar pain as well as trials for evaluation of the long term results as there are not many clinical trials. Other future clinical research may include the optimal treatment number and timing of treatment and specifically for electroacupuncture, the optimal treatment frequency settings. Huisheng X, Colahan P, Edgar O. Evaluation of electroacupuncture treatment of horses with signs of chronic thoracolumbar pain. Journal of American Veterinary Association 2005;227:281-286. Ridgway K. Acupuncture as a treatment modality for back problems. Veterinary Clinics of North America: Equine Practice. 1999;15:211-221.